Images from ​Coriolis: Emissary Lost, 3 Laws of Robotics, Star Wars Allies and Adversaries, and The Lord of the Rings: Journeys in Middle-earth. 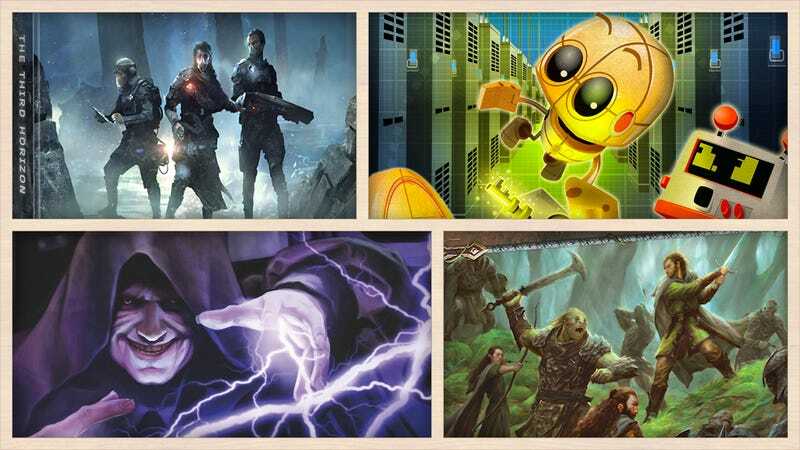 Welcome back to Gaming Shelf, io9's regular column all about the latest in tabletop and roleplaying game news—focusing on sci-fi and fantasy stuff, of course. Toy Fair 2019 is on the horizon, and io9 will be there! In the meantime, we’ve got plenty of newly announced games for 2019, including a Kickstarter for a brand-new TMNT release and a revival of a classic spy game. Let’s dive in and see what we find. Fantasy Flight Games is taking us deep into Tolkien territory with its latest cooperative board game, The Lord of the Rings: Journeys in Middle-earth, which has players take on the role of heroes of the Free Peoples as they fight against Sauron’s evil forces. Since Journeys is app-supported, each individual game is catalogued as part of a single adventure in a larger campaign, taking players across Middle-earth in a series of quests. The app also lets players keep track of their characters’ stats and abilities. Journeys in Middle-earth is currently available for pre-order, and is set to come out by the end of June. A look at Proving Grounds. Group games are a great way to hang out and make friends, but sometimes you just want to play by yourself. Renegade Game Studios has launched the first game in its single-player Solo Hero Series, a solitaire dice game called Proving Grounds. Designed by Kane Klenko with a story by Monica Valentinelli, Proving Grounds centers around a royal named Maia Strongheart, who was framed for the death of her queen mother and now has to complete a deadly trial to restore her honor and claim the throne. Proving Grounds is currently available for preorder and is set to come out this April. Science fiction writer Isaac Asimov came up with his three laws of robotics as a way to hopefully defer our inevitable fall at the hands of bots. In Floodgate Games’ new 3 Laws of Robotics game, four to eight players attempt to figure out their loyalties among a group of imprisoned robots. Players can ask other players for clues, but they must adhere to a series of laws that are introduced throughout the game, making it increasingly difficult to suss out who’s who. Created by Ben Kanelos and illustrated by Tristam Rossin, the game is expected to be available come March. Star Trek: Deep Space Nine Fluxx! You can gauge the popularity of a game by how many iterations it’s spawned, and while Fluxx hasn’t quite reached Monopoly’s near infinite number of spin-offs, the game is available in countless flavors, including a forthcoming Star Trek: Deep Space Nine version. Details are scant at the moment, aside from players working alongside DS9 characters to study the wormhole, or amass a fortune in latinum, but the ever-changing rulebook Fluxx is known for will still be in play. It’s a tale as old as time: A kid is the only witness to a spacecraft crashing here on earth, and while authorities are aware of the incident, and are trying to infiltrate the craft, only the child can figure out how to get through the UFO’s forcefield. In Visitor in Blackwood Grove, an asymmetrical game from Resonym, available April 3 for $20, one player takes the role of the alien visitor, making up rules as to what can and can’t penetrate its spaceship’s force field, while the kid and the government agents secretly test various materials to try and figure out how to get to the mysterious visitor. Restoration Games has set its eye on restoring and re-releasing a classic 1970s spy game, Conspiracy: The Solomon Gambit, which involves secret agents moving around a board trying to get a briefcase to their headquarters. Originally designed by Dr. Eric Solomon, the game is unique in that the agents don’t belong to the players—instead, players share the pieces as they secretly try to pay off the agents in blind bidding wars. As reported by Dice Tower News, the new version has made a few changes, most notably reducing the number of agents and adding train stations for easier movement. Conspiracy will be released on June 12. Speaking of wider release, PhD Games has announced it will soon be releasing the Riverdale edition of Clue, which was previously a Hot Topic exclusive. Out of all the shows and films that have been adapted into Clue games, Riverdale definitely makes the most sense (one of the main characters is practically Miss Scarlet already). It’s all about the lovely teens of Riverdale trying to figure out which one of them murdered Jason Blossom, which was the main plot of the first season. We’re just dying that one of the murder weapons is maple syrup. Come on, guys, that’s genius. According to Dice Tower News, in a recent episode of the Board Game Gumbo podcast, Stronghold Games’ Stephen Buonocore confirmed that brothers Jacob and Issac Fryxelius are working on an ever-evolving legacy version of the 2016 hit, Terraforming Mars. There are little to no additional details at this time, and Buonocore predicts a potential release in 2020 or 2021 as the game is still only in the early development stages. Your kids are never too young to be indoctrinated into the world of board gaming, and with iello Games’ Zombie Kidz Evolution hitting shelves on March 7 for $23, players as young as seven years old can team up to help defend a secure grade school from a zombie invasion. iello Games also claims this is the first legacy-style game designed for children to learn the concept, where the rules of the game become more complex every time it’s played, using 13 envelopes that each contain additional gameplay material and guidelines. Free League Publishing’s space opera roleplaying game, Coriolis: The Third Horizon, is finally getting its first expansion. Emissary Lost centers around a series of murders called “The Mysticides,” with players having to figure out who is killing mystics before it’s too late. The expansion is set to come out this September, following a successful Kickstarter campaign. Bargain Quest, a game where capitalism plays a key role in success, requiring players to stock their shops with items that will lure heroes to help protect them from monsters, is getting a seedy upgrade from Renegade Game Studios with Bargain Quest! The Black Market Expansion. Available come May for $20, the expansion adds new heroes to woo, new shop employees, and new game modes that bring players to a dangerous black market in order to find items to lure shoppers, who will in turn ensure nothing happens to their stores. Fantasy Flight Games is releasing a new sourcebook for Star Wars Roleplaying called Allies and Adversaries, which has collected over 130 NPC profiles for heroes, villains, and all sort of classic and modern Star Wars characters. It can be used for roleplaying campaigns like Edge of the Empire, Age of Rebellion, and Force of Destiny. It’s expected to be release by the end of June. Even with a unique gameplay mechanic like customizable dice with removable faces—something that has helped keep rounds of Dice Forge unique and varied for years—Libellud still has an expansion en route. Dice Forge: Rebellion that introduces even more die faces to use, a labyrinth to explore that increases players capabilities until they reach the Minotaur at its center, and 30 new exploit cards that promise to change players’ techniques and tactics. Sword and Sorcery is getting a few additions, including the final campaign expansion of the game. Vastaryous Lair is the last expansion, as well as the climax in the Immortal Souls campaign. According to the press releases, heroes will final their highest Soul Rank and get equipped with new legendary powers and equipment as they face off against a five-headed dragon named Vastaryous. The game also has two upcoming Hero Packs featuring new heroes Volkor and Skeld. All these expansions will come out in March. To be enjoyable, most role-playing games need a lot of players, a lot of equipment (rule books, boards, tokens), and a lot of time. Destination Danger was designed to make it much easier to just dive in and play, requiring just a small deck of cards, and a handful of players who won’t need much time to familiarize themselves with the game’s basic rules. Set in the 1930s, it’s a role-playing adventure that seems inspired by Indiana Jones’ exploits, which is OK by us. The game has already met its modest Kickstarter crowdfunding goal, and with a $20 contribution you can secure yourself a copy, with delivery expected as soon as March. Trends may come and go, but cyberpunk is one that has stuck around. Carbon 2185 is a new roleplaying game that turns players into cyberpunk rebels fighting against megacorporations that rule San Francisco, and the world. For those still waiting for the second season of Altered Carbon, this might be a good way to pass the time. It’s already received its funding, and will be on Kickstarter through February 15. Let the dark magick begin. Dark Rituals: Malleus Maleficarum is a 2-5 player miniatures game from DG Games Entertainment. It’s about a group of heroes trying to defend villagers from a coven of evil witches—who are led by one of them players themselves (for that one friend who loves playing the bad guy). There’s also a solo mode, for those wanting a quiet evening of game playing alone. It’s already been funded, and will be on Kickstarter through February 12. The darkness continues to rise on Kickstarter. Mephisto is a 1-4 player dungeon crawling card game where players compete to be the one person to defeat Mephistopheles’ dungeon monsters and claim his unholy prize. With a bright, tarot-inspired design and lots of creepy twists and turns, this one looks like a devilish good time. It’s received full funding, and will be on Kickstarter through February 14. Is saying “cowabunga!” cool again? No? Well, we don’t care, because IDW Games is expanding its Teenage Mutant Ninja Turtles Adventures series with a couple of expansions that have already crushed their Kickstarter crowdfunding goal. That includes over 30 new scenarios, more than 100 new highly-detailed miniatures featuring characters from the TMNT comics, and a new cooperative mode that uses a card-based AI to control the bad guys you’re playing against. Pledge levels start at $125, but it looks like you’ll need to cough up $250 to get all of the new stuff, and a little patience as delivery isn’t expected until October. Insured doesn’t have players poring over details of insurance premiums, trying to get the max coverage for the minimal monthly fee. Instead, it’s a board game where up to eight players find themselves trapped, and struggling to stay alive by completing objectives, or by eliminating each other. With 30 days to go on its Kickstarter Crowdfunding campaign, Insured: The Survival-Based Board Game hasn’t quite reached its funding goal yet, but a pledge of $27 will help it along, and get you a copy of the game when it’s expected to ship to backers in June.